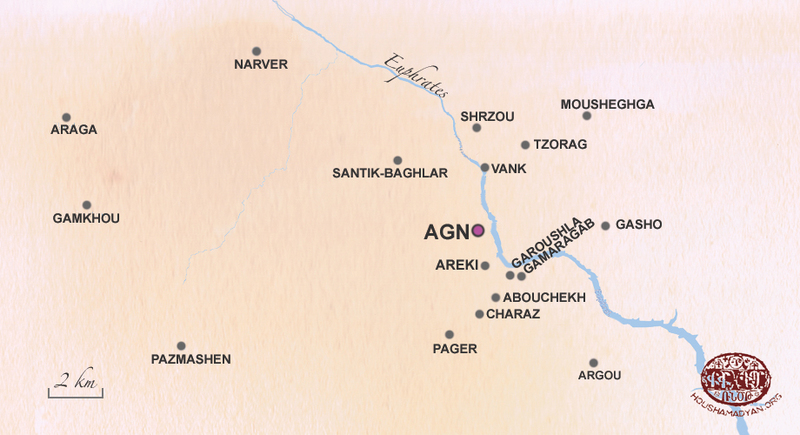 The map of the kaza of Agn/Eğin with its Armenian and Hay-Horom populated villages (See the current names below). Agn/Eğin [Kemaliye]; Santik-Baghlar [Sandık]; Gasho [Yeşilyamaç]; Vank [Yaka]; Shrzou [Esertepe]; Tzorag; Mousheghga [Kocaçimen]; Narver [Gümüşçeşme]; Areki [Ariki]; Garoushla [Yuva]; Gamaragab [Toybelen]; Abouchekh [Apçağa]; Charaz; Lidj [İliç]; Araga [Duruköy]; Argou [Ergü]; Pager [Sırakonak]; Gamkhou [Akpelit]; Penga [Adatepe]; Pazmashen [Gözaydın]. Under this general heading you will find articles on different themes (economy, socio-economic structure, local characteristics, oral traditions, history, religion, etc.) related to the kaza of Agn/Eğin.